Amanda Presgraves, believes you will achieve greater satisfaction when you build a business around a feeling you desire than chasing after some arbitrary numerical goal. 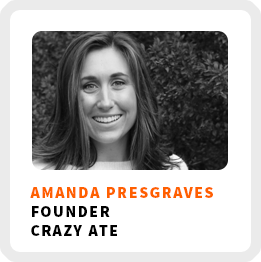 She’s the founder of Crazy Ate, a meal kit delivery service for kids school lunches. She also has a work hustle as the a sustainability manager at James Madison University. Amanda works on lots of different projects and has loads of ideas, but they all revolving around the thread of her career to promote a healthier world through education, collaboration, and innovation. How she cultivates her curiosity by coming up with at least 5 ideas a day. Why she decided to get a work hustle as she continues to work on her business. How she’s able to identify the thread of her career that ties all of her various projects together. Why she believes you are a product of the people you surround yourself with. How an injury sparked her idea to start a food truck. Superpower: Having a lot of energy and stamina to help bring out the best in others. Regains focus by: Committing to something and not making it an option. Favorite productivity tool: Her planner and Wunderlist. 90-day goal: Do more customer discovery, apply to more accelerators, seek out strategic partnerships, reexamine the business model to make sure it’s the best option, and have the pilot program running for summer. 1) Breakaway from trying to make it perfect. If something’s perfect when you put it out, you waited too long. 2) Get out and talk to people because if it’s perfect for you, it may not be perfect for the customer. 3) Work on being comfortable with being uncomfortable by pushing yourself in different areas, like athletics.